Since the Double Compche ride, Michel had lobbied for another bike tour. The window of opportunity arrived in early November at the end of his one-week vacation. In the meanwhile, Jim Korte signed onto the adventure. Three riders times three days equaled one long weekend of fun and exciting times. 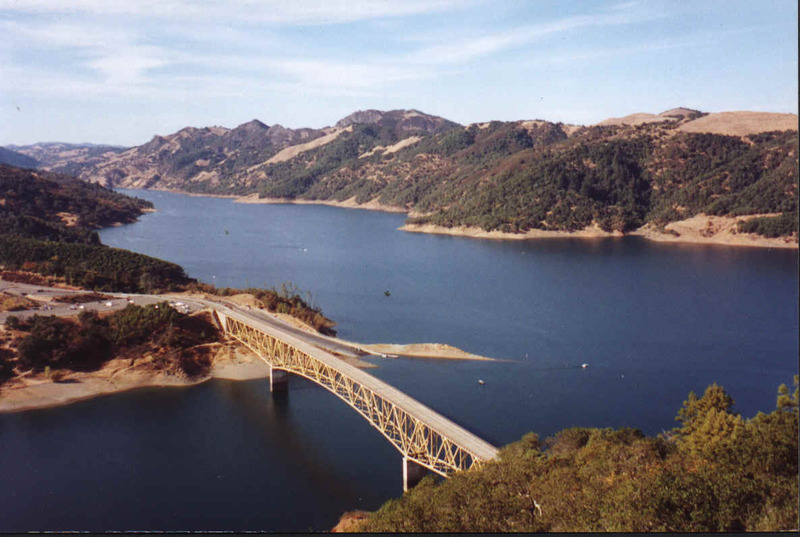 The chosen route was from Jims house in Healdsburg out Skaggs Spring Road to the coast, then down the coast to Jenner and returning to Healdsburg by way of West Side Road. Michel arrived in Calistoga early Friday morning. We changed his mountain bike tires to more accommodating road tires for the strictly paved route. At Jims house we installed a rack on Michels bike and loaded a small mountain of gear. We figured there was 40 pounds of stuff on a rack that was designed for 25 pounds. Jim grabbed his Sawsall and cut a strut of wood to boost the carrying capacity of the structure. It would carry the load without fail for the three days. The weather could not have been better. The fall temperatures were ideal, though cold at night. The sky was clear and bright. Jim and I worried about Michel and his paper thin sleeping bag. We both have much more experience camping and can accommodate adverse weather. However he seemed to fare well and didnt freeze during the two nights of frosty temperatures. The ride began on Dry Creek Road. This route is flat and exceptionally scenic. The grape vines were in their maximum display of fall color. The crush was over and activity in the vineyards was minimal, as was the tourist traffic in this popular wine growing valley. For nearly ten miles the countryside sailed passed with ease. We knew this wouldnt last long. The Skaggs Springs road takes the traveler from the flat lowlands into the rugged coastal mountains. 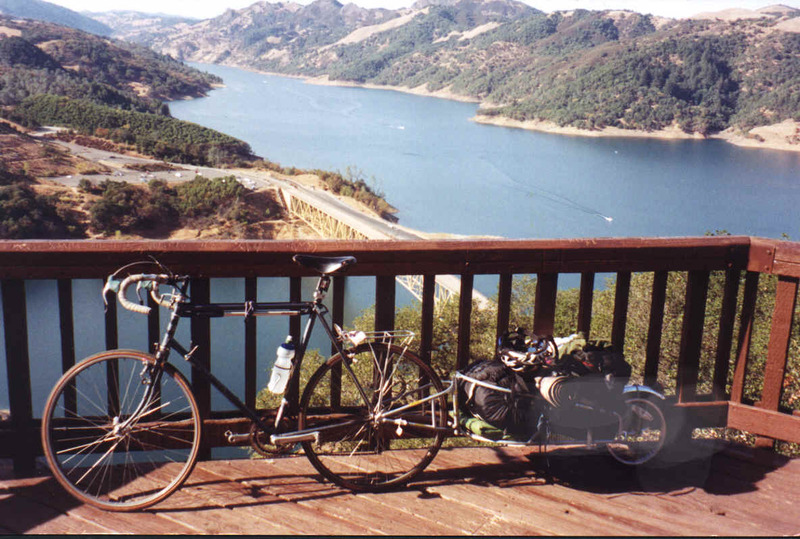 We stopped at the Lake Sonoma view point and took our first break of the ride. The view over the lake and distant mountains is spectacular. We soaked up the beauty for a long time, ate munchies and made some minor adjustments on the equipment. Then we began the arduous climb to crest the high mountain barrier. What was surprising was the second climb, nearly as high as the first. With all the gear on board, progress up the steep hills was snail-like. As the afternoon wore on, we had to think about finding a spot to camp. The winter day ends early and we started late. As the sun headed for the horizon we began to be in a race to find a suitable spot before darkness set in. We crested the last major hill of the day with the sun nearing the end of its day. We were high in the hills and needed to be near water for camping. We rocketed downhill towards the valley where we knew we could find streams. As the road began to flatten we saw a flat shelf near water. It was perfect. Though near the road, it was none-the-less out of sight. We eagerly scrambled down the hill and inspected the area. The sun was fading fast. We were home for the evening. 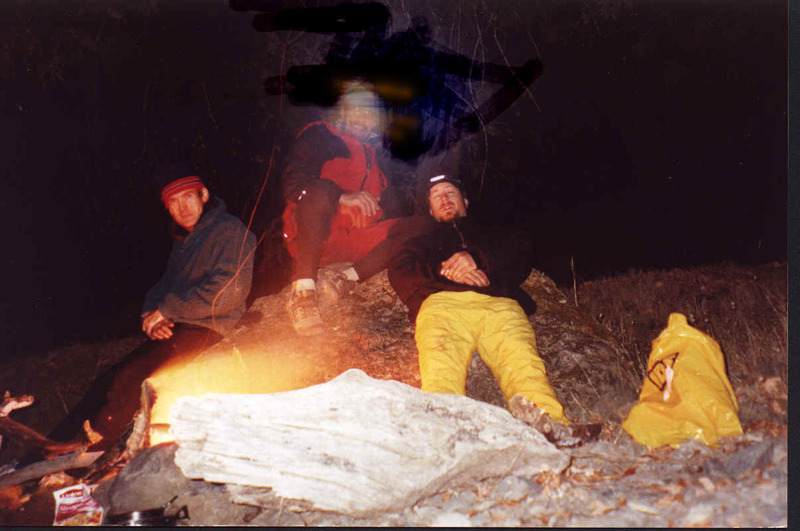 The first step in establishing the campsite was the location of each persons personal sleeping site. Each person seems to have criteria that favor some spots over others. Some like it in the open, others in closed places or tents. Three spots near each other were quickly chosen and preparations for the evening began in earnest. Jim threw his tarp down and was ready for the night. Michel and Eric set up two tents. A dome tent for Michel and a smaller, bivy type for Eric. The next pressing issue was to gather an evenings supply of wood before the light faded altogether. The surrounding area was generous. An easy supply of very dry wood was readily available. We would have to be careful not to set the dry woods on fire. We selected a spot next to the water, far from the tinder dry grass on the adjacent hillside. There was concern about the fire being visible from the road, yet after the passage of many cars, we decided there was only a very slight angle that anyone could even get a glimpse for only a brief instant. The wood was so dry that the fire created very little smoke. The highlight of the evening came in a simple form. 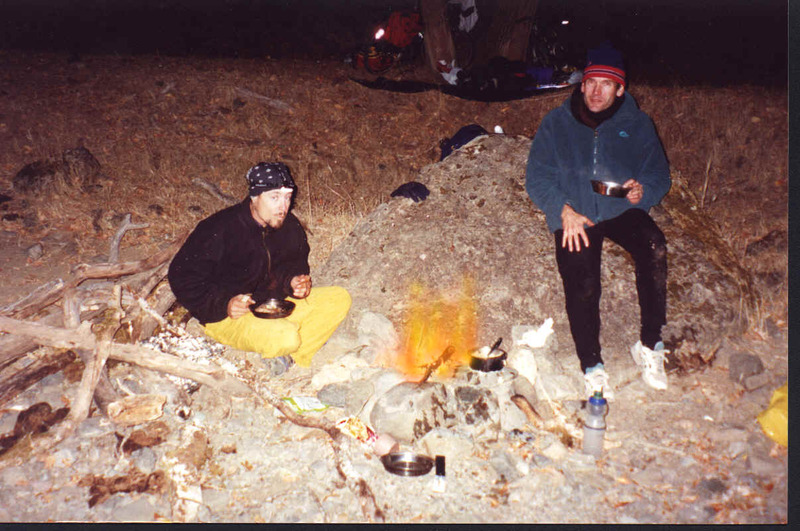 When camping, the most simple things can yield great pleasure. . We had plenty of food. But we lacked some good munchies. When Michel announce that he had potato chips, it was as if a prayer had been answered. We proceeded with dinner. Jim cooked a steak roughly the size of a tractor tire. It turned out to be enough for all of us. That was in addition to soup, noodles and bread. After all of the hard work, the meal was extra satisfying. We relaxed by the fire and watched the eternal dance of the flame. Eventually it was time to retire. The temperature had descended into the thirties. Michel would teeter on the fine line of warmth and a very long night. Eric squeezed into the bivy tent for another attempt to fall in love with this technology. It would fail. By morning it was soaking wet. Jim simply flopped down on his tarp and was sawing logs in seconds. Eric was far enough away from Jim to not be bothered by the snoring. Unfortunately for Michel he was between the two snoring bikers and heard both. Although he wouldnt admit it, that night might have been one of his longest ever. The faint light of the new day began to appear in the dark sky. Slowly the trees and the landscape reappeared. The surroundings once again became fully light. The three adventurers arose and began the coffee ritual. Again Michel, a novice camper, astounded the veterans by producing an espresso maker. Bad coffee tastes good when camping. Espresso seemed almost sinful. The requisite pot of oatmeal was created. Several different flavors, peaches and raisons conspired to make this dish delightful. The hot cereal perfectly offset the crisp cold air. After breakfast, the yard sale that was our campsite quickly disappeared into all of the bags. The ritual of fixing the bags consumed a few minutes then all of the equipment was hauled up to the road. The nicest part of Skaggs Springs road lay ahead of us. We proceeded at a comfortable pace along the scenic and remote road. At the first hint of a climb, we stopped to shed layers of clothing. In the process, Eric managed to step on the camera, eliminating photos for the rest of the ride. The pace was mellow and not as fast as the beginning of the first day on the flats. On the first day, Jim was able to shred pretty well despite a raging hangover. He died on the hills. It was a miracle he made it to the first camp. The biggest climb of the day was reasonable. It took a half hour or so to get up to the Reservation. Then the road dropped to the ocean. And a store. We made key purchases (munchies and beer) and headed south for Reef Campground. It would take a couple of hours to get there. Along the way we stopped at Salt Point State Park for a break. By then we were hungry. The sandwiches, trail mix and bars tasted delightful. We tarried knowing that we had plenty of time to complete the few miles to the campground. We scaled a large rock and sat with utmost contentment before the beautiful Pacific ocean. Back on the road again, we had one more stop. We would buy more beer for the night and cruise to the campground. 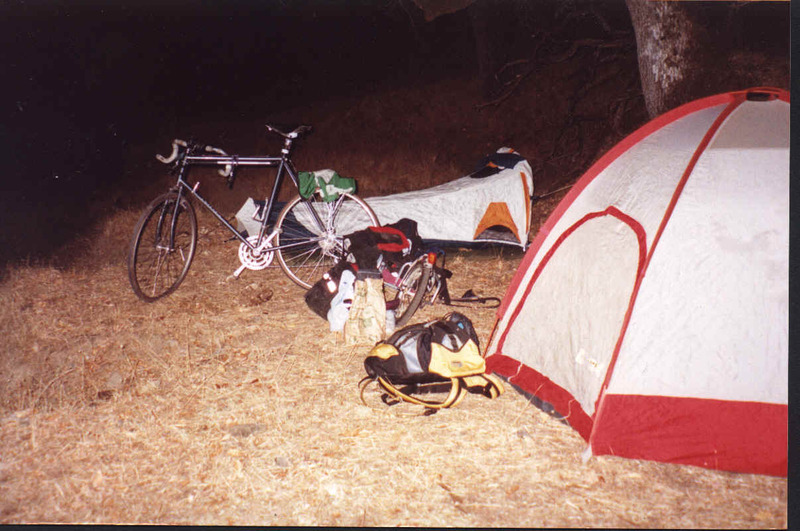 We had some concern during the day that we may find the campground closed for the season, as we did on the 6-day ride a few years ago. This year it was open. We would have stayed there open or closed. But the comfort level is higher when we dont have to trespass. We went through our drill of finding our individual spots. Jim slept next to the raccoon freeway. They would be kind and not chew on his nose during the night. Michel slept in the brushy hollow and Eric negotiated for the only level spot in the site. There was still plenty of light when we arrived at the camp. We had plenty of time to kick it and relax. There was no panic to get the camp together in the daylight as frequently happens during the shorter days. We took the time to gather wood (Illegal) for a long evening of flaming entertainment. Jim climbed a precariously dead tree and loped off a few large limbs. As sunset approached, we scaled the hill that divided us from the ocean and took a front seat to a superb offering from the western sky. The sun grew into a brilliant orange ball and painted an assortment of clouds. It dazzled our eyes for nearly a half-hour as our day closed in serene beauty. Dinner was another tasty offering. The days effort demanded calories. We had steamed veggies al pasta. It deeply satisfied our great hunger. We sat and watched the fire for another couple of hours. Actually, Michel and Eric watched Jim use up all of the evenings supply in an alarmingly intense fire, then completely sack our morning wood as well. After Jim Daved the fire to exhaustion, he announced bedtime and hit the sack. The night was mild and not cold. The moderating effect of the sea kept the temperature very mellow. The dawning of Sunday morning heralded in a day that would stand out as notable in the annals of the bikin fools. The ride part of it was near perfect. The temperature was cool, the wind was light in a good direction and the sky was bright and clear. The coastal road rises and falls along the Pacific. Eventually it comes to Jenner and the mouth of the Russian River. Highway 119 is nearly flat as it follows the river. We rode to Duncans Mills and drank mochas and ate delicious pastries. The caffeine and sugar would help to speed up Erics metabolism. Combined with the normal "runners high" associated with cycling, he was only one chemical notch below "tweeker". It was perhaps an element in attracting, out of the clear blue, a loud, extended horn honk. This frightening jolt of alarm caused yet another cascading of chemistry in Erics already revved up state. Jim was leading the procession. He was ahead, Michel was behind. 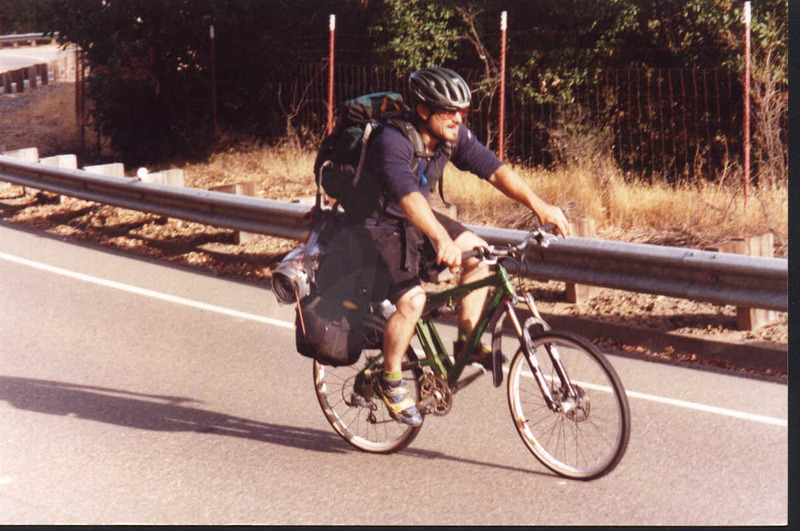 When Eric arrived in Guerneville, he saw the offending car stopped in traffic for a red light. Eric passed Jim who had stopped at Safeway and had road rage problems of his own. Eric proceeded through town until he approached the car. As he passed, he was forced to make a defensive move and slapped the door of the instigator of this bizarre chapter. The lower-brain stem inspired activity intensified when the 350 pound, female, candidate for a harpoon went 100% ballistic. "Oops," Eric muttered to himself as he, and most of downtown Guerneville had to endure a monologue of profanities not often heard in soprano at volume 10. Eric stopped at the light and waited for Jim and Michel to regroup. As the traffic began to move, Capt. Ahabs nightmare drove into the intersection, stopped and barked out another streaming of well punctuated naughty words. At this juncture it was clearly best to not engage any further in a deteriorating scene. The three bikers tried as best they could to ignore Moby Jane and proceeded down the road. "You there," the Sheriffs voice announced, "On the bicycles, pull over." "Stand back, or youre going to jail!" The sheriff barked at the lady. One had the impression that they had met before. From that point, Sheriff Bone spent most of the next hour getting the poster family for meth-amphetamine to calm down. While waiting, Jim asked the other officer; "Do you know double D from the jail?" "O heck ya!" The officer responded, "Awe, hes a great guy." Although it was a stupid thing for Eric to have done, it was fairly clear early on that this was a non incident that did not need the response of the law. It was no more than the standard stupidity that progresses no further than a mild vocal report or infamous gesture. At one point a complete stranger approached the sheriff and reported that she had witnessed the incident and that the lady was nuts. There was a huge lesson for Eric in this incident. To engage in such negativity never produces positive results. It can be a simple knee-jerk response, but the consequences can be very grave. Not only in terms of public drama, but in the mind that allows the incident to continue at all. It shows a lack of inner peace. How could such a non incident bother one who is rooted in quietude, peace? For Eric it provided a critical point to ponder, a state of mind to banish forever. For the lady, a week later she would go on to stab her parents and commit suicide. Did that slap on the door begin a fatal cascade of events? The bikin fools continued their journey. At first fear of reprisal from tweeker dad kept the three spinning as fast as humanly possible. They felt vulnerable along River Road. They had to shred to West Side Road before feeling at ease again. The drama settled to a dull roar, it faded into the background as the beautiful cycle touring again took the drivers seat for the day. The three pedaled along West Side road. There were only very minor rises and descents. Again the beauty of the day saturated the senses. Other bikers were out enjoying the Sunday afternoon. 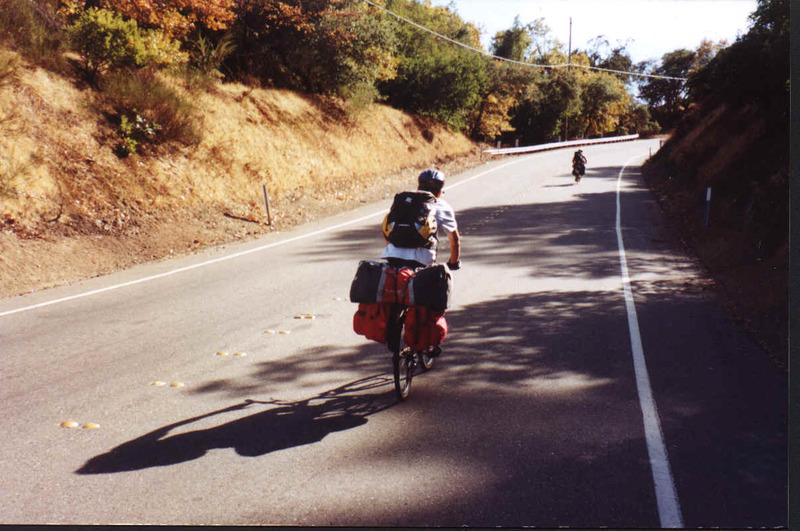 Eventually West Side road came into Healdsburg. We had completed over one hundred miles of very challenging and awesomely beautiful California countryside. For the last several miles of the ride, thoughts of the brewpub flooded the synapses. The beer and burger could not have been more perfect. The three delighted the culinary senses and exchanged notes about the ride. It was a beauty. The three days were each unique, notable and memorable. The campsites were great, the weather was spectacular and the company was tight. Adventure had been achieved. In the tired quietness of the ride home in the car, both Michel and Eric began to think about what might be the next outing. A moment that says; "It doesn't get any better than this!"